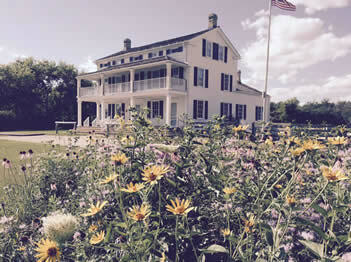 In 1985, Elmbrook Historical Society members began establishing gardens at the stagecoach inn. The prairie was seeded in 1991 by PRAIRIE NURSERY of Westfield, WI. The project was funded by the Elm Grove Garden Club and volunteers from the club watered and weeded the newly planted quarter-acre area. 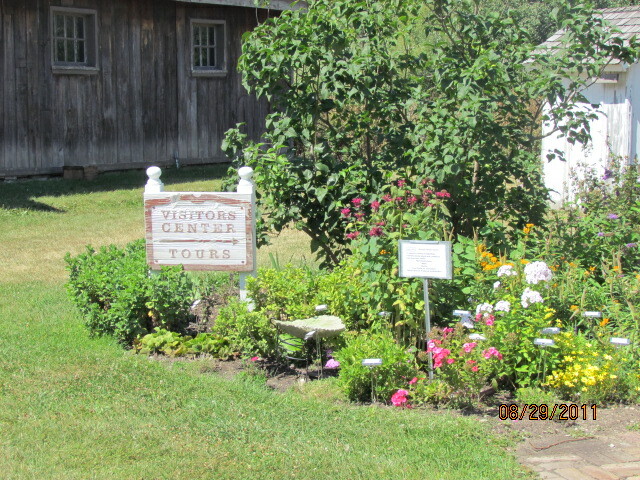 The gardens were maintained by historical society members and other volunteers. In 2008, Master Gardener Volunteers became welcomed partners in these gardens. Native plants were planted on the east side of the property. These plants are representative of the fields that covered the undeveloped lands in the Elmbrook area. The prairie starts its bloom in June and continues through October with peak bloom in July-August depending on the rain and sun. While the flowers and grasses are only at ground level in the spring, they reach over six feet tall in late summer. 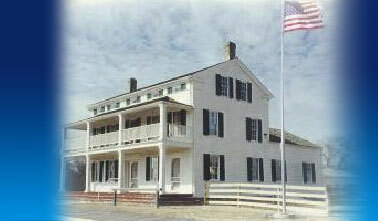 The inn-keeper’s wife, Mrs. Brown, prepared all the meals for their guests. Produce and main dishes (fish or game) would be harvested from their farm. Pioneers in the 1850s had little time to garden. An herb or kitchen garden would be located just beyond the kitchen door. Herbs would be used for culinary and medicinal purposes as well as for fragrance. When researching the types of veggies grown in the 1880s, Master Gardeners learned that 100 heads of cabbage would have been planted for each family member. A fresh approach uses old-time plants in a small space garden. One large square is devoted to potatoes. Herbs, vegetables and flowers are in the other squares. Flowers were added for fun. Some flowers, such as Lady’s Mantle and Lavender, are herbs. 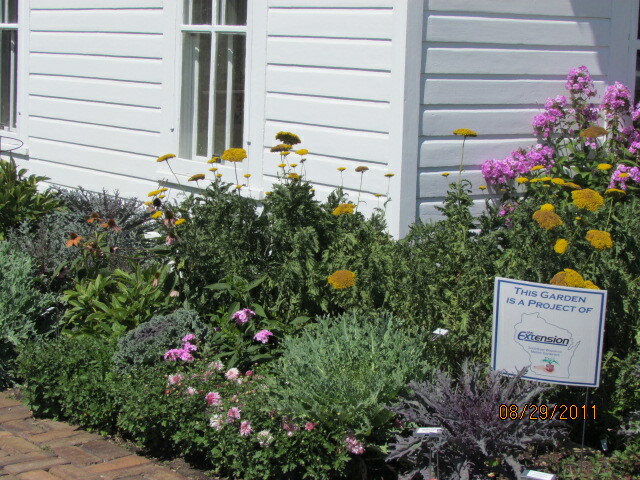 You will find many perennials located outside the Donaldson log home built in 1852. The heirloom perennials are taller and more willowy than their modern counterparts, but they are also more resistant to disease. The challenges gardeners face in these gardens today are choosing drought tolerant and deer resistant heirloom plants. During the 1800s, water was at a premium. A hand-pump provided water for the household, but the farms and the gardens relied on nature’s rainfall. 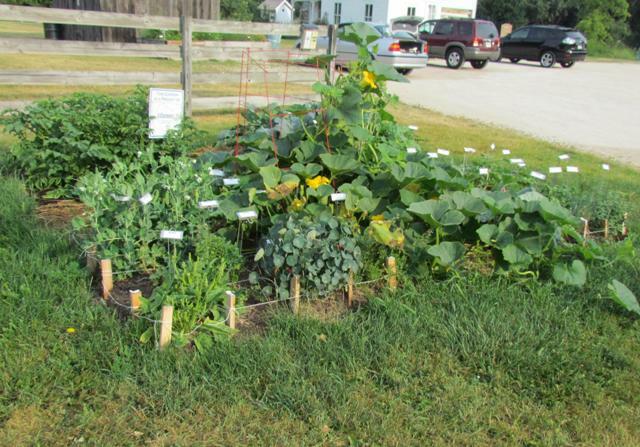 A registered and certified Monarch Waystation garden has been added to encourage the return of these important pollinators. The population of monarch butterflies has declined significantly in recent years due to the loss of their habitat and the widespread use of chemicals in lawn, garden and as agricultural controls. The monarch garden was been designed and is maintained by Master Gardener volunteers. You can learn more about the needs of monarch butterflies and their caterpillars...and encourage them to join your own garden. 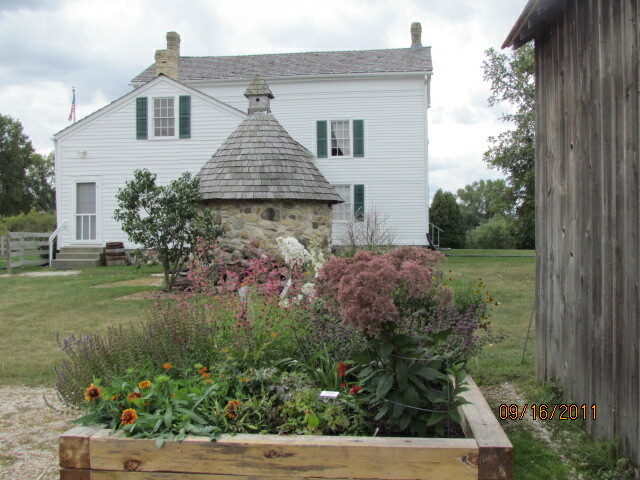 A raised bed was added near the Ice House to create a focal point for visitors. Many native plants are found in this raised bed, including ornamental grass, prairie coneflowers, Joe Pye Weed, meadow sage and other perennials. When adding a raised bed, make sure the location, height, width and length of the bed allow easy access for gardening. In choosing plants, make certain they like the amount of sun (or shade) they will receive, along with the amount of moisture and type of soil they require. Mature height, space and bloom time are also important factors to consider. Text and photos by Janet Wintersberger.